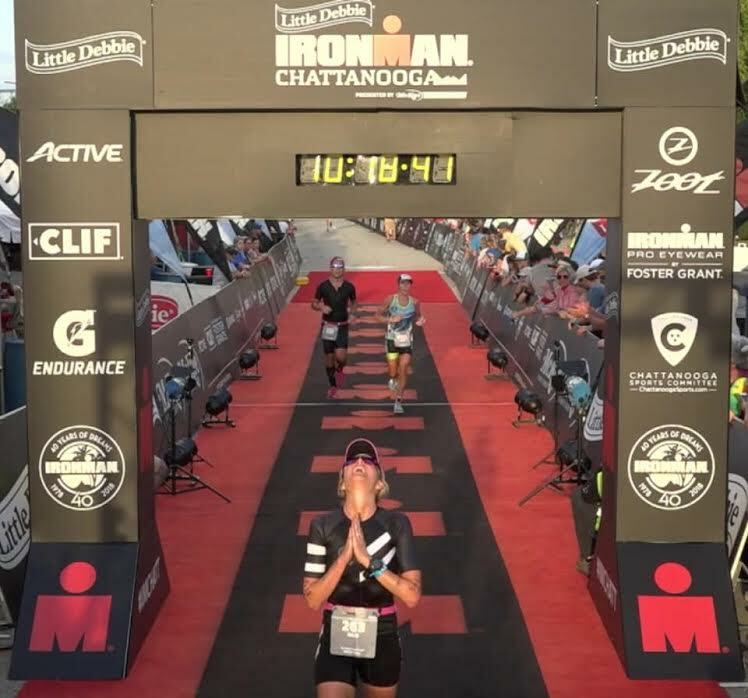 But in the words of Mike Tyson, ‘Everyone has a plan until they get punched in the face’ … and the Chattanooga course threw a few punches. Especially those last 4-5miles where I found my legs cramping and locked up to the point where I could no longer move forward. 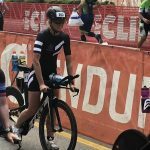 I felt my race ‘slipping away’ and I think that hurt worse than the excruciating pain that left me collapsed on the pavement by 25. 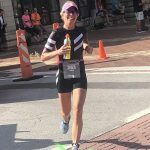 My legs locked and spasmed uncontrollably as four other athletes stopped and helped me get control and back up to walk/run/limp to my finish. 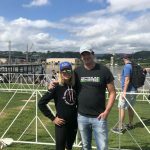 One gal stayed with me and fed me salt until I could get going to the finish line … that’s one thing about this sport I love most, the teamwork and support for one another – it’s simply amazing! The marathon is my first love, and it shows in my running … the allure of that ‘almost too far’ distance intrigues me and the run itself – simply powered by your own will and two feet is something truly unique in sport. It captured my heart years ago and will forever be my happy place! 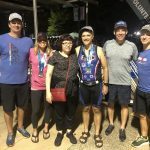 I had passed by several Dallas peeps who lifted me with encouragement (thanks guys!!) and was coming up on Beckley on the infamous Barton avenue hill… he looked so happy, strong and killing it! 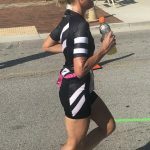 I told him I was starting to cramp and within a mile I was down in the grass grabbing my legs as they pulled up towards me in varying directions – I was trying not to cry and appear weak but I was fighting the tears as hard as I was fighting my legs. I’ve never been sidelined like that before – almost out of nowhere?! A lady helped me get going again – pumping me up with inspiration and comforting words 🙂 I proceeded on with my legs twitching and nausea setting in… I couldn’t believe what was happening? But my support crew was simply AMAZING! They were everywhere along the course with all the right information- I can’t thank them enough for lifting me up out there when I needed them most. 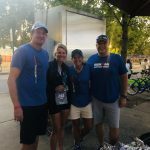 Paul, Jenn and Chad literally split up my last 4-5 miles (jogging to various mile markers) to help pull me in as I was losing it. Paul got word that I fell apart after coming down Barton and jogged down there and helped me back up with his ‘tough love’ 😉 He claims, he’s never seen me like that before – and not sure I’ve been to such a dark place either? Chad found me on the bridge after the pavement came up and grabbed me at 25 and followed me a bit to make sure ok to finish where Jenn was waiting at the chute. Seriously, Not sure what I would do without them? My heart is so full! I often race above what my training suggests, I take risks and I put it all out there. Knowing myself, if I were to do it all again I would probably blow up on the second try too… you know why? I’m always pushing the limits! I never want to get to the end off a race and think, ‘I could have done more?’ Or feel like I still had gas in the tank. 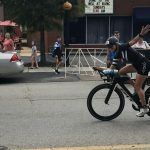 So, each race is a learning experience- and I’ve gained so much out of IMCHOO! So, no matter if you’re charging out front, hanging off the back, or buried somewhere in the middle of the pack out there, you gotta FIGHT for YOUR personal best! There’s something about embracing this approach to racing that stays with you far beyond the finish line and into everyday life. 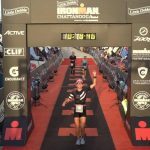 When I’m in an Ironman, I see it as a massive honor and privilege to be out there, and be able to physically do it, and complete it. There’s something glorifying about pushing yourself over and over to the dark side and crossing over to see the glorious light. It was an amazing day and I feel incredibly blessed and thankful for all the people who supported me on this journey! It certainly wouldn’t be possible without my amazing coach unlocking potential within me, my training buddies for always going the extra mile by my side, my work family for their understanding during the season, my husband for his unconditional love and support and all the teammates, friends and family who have supported me every step of the way! Love to you all!